Mainland Southeast Asia, also known historically as Indochina, comprising parts of Northeast India (Part of India east of Siliguri Corridor), Vietnam, Laos, Cambodia, Thailand, Myanmar and West Malaysia. The region lies near the intersection of geological plates, with both heavy seismic and volcanic activities. The Sunda Plate is the main plate of the region, featuring almost all Southeast Asian countries except Myanmar, northern Thailand, northern Laos, northern Vietnam, and northern Luzon of the Philippines. The mountain ranges in Myanmar, Thailand, and peninsular Malaysia are part of the Alpide belt, while the islands of the Philippines are part of the Pacific Ring of Fire. Both seismic belts meet in Indonesia, causing the region to have relatively high occurrences of earthquakes and volcanic eruptions. Southeast Asia covers about 4.5 million km2 (1.7 million mi2), which is 10.5% of Asia or 3% of earth's total land area. Its total population is more than 641 million, about 8.5% of the world's population. It is the third most populous geographical region in the world after South Asia and East Asia. The region is culturally and ethnically diverse, with hundreds of languages spoken by different ethnic groups. Ten countries in the region are members of ASEAN, a regional organization established for economic, political, military, educational and cultural integration amongst its members. The region, together with part of South Asia, was well known by Europeans as the East Indies or simply the Indies until the 20th century. Chinese sources referred the region as 南洋 (Nanyang), which literally means the "Southern Ocean." The mainland section of Southeast Asia was referred to as Indochina by European geographers due to its location between China and the Indian subcontinent and its having cultural influences from both neighboring regions. In the 20th century, however, the term became more restricted to territories of the former French Indochina (Cambodia, Laos, and Vietnam). The maritime section of Southeast Asia is also known as the Malay Archipelago, a term derived from the European concept of a Malay race. Another term for Maritime Southeast Asia is Insulindia (Indian Islands), used to describe the region between Indochina and Australasia. The term "Southeast Asia" was first used in 1839 by American pastor Howard Malcolm in his book Travels in South-Eastern Asia. Malcolm only included the Mainland section and excluded the Maritime section in his definition of Southeast Asia. The term was officially used in the midst of World War II by the Allies, through the formation of South East Asia Command (SEAC) in 1943. SEAC popularised the use of the term "Southeast Asia," although what constituted Southeast Asia was not fixed; for example, SEAC excluded the Philippines and a large part of Indonesia while including Ceylon. However, by the late 1970s, a roughly standard usage of the term "Southeast Asia" and the territories it encompasses had emerged. Although from a cultural or linguistic perspective the definitions of "Southeast Asia" may vary, the most common definitions nowadays include the area represented by the countries (sovereign states and dependent territories) listed below. 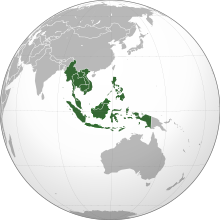 Ten of the eleven states of Southeast Asia are members of the Association of Southeast Asian Nations (ASEAN), while East Timor is an observer state. Papua New Guinea has stated that it might join ASEAN, and is currently an observer. Sovereignty issues exist over some territories in the South China Sea. Some southern parts of Mainland China, as well as Hong Kong, Macau and Taiwan (a disputed region or nation), are also considered as part of Southeast Asia by some authors. Political map of Southeast Asia. The Andaman and Nicobar Islands of India are geographically considered part of Maritime Southeast Asia. Eastern Bangladesh and Northeast India have strong cultural ties with Southeast Asia and sometimes considered both South Asian and Southeast Asian. Sri Lanka has on some occasions been considered a part of Southeast Asia because of its cultural ties to mainland Southeast Asia. The rest of the island of New Guinea which is not part of Indonesia, namely, Papua New Guinea, is sometimes included, and so are Palau, Guam, and the Northern Mariana Islands, which were all part of the Spanish East Indies with strong cultural and linguistic ties to the region, specifically, the Philippines. The region was already inhabited by Homo erectus from 1,000,000 years ago during the Middle Pleistocene age. Homo sapiens reached the region by around 45,000 years ago, having moved eastwards from the Indian subcontinent. Rock art (parietal art) dating from 40,000 years ago (which is currently the world's oldest) has been discovered in the caves of Borneo. Homo floresiensis also lived in the area up until 12,000 years ago, when they became extinct. 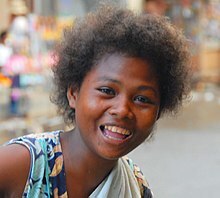 It has been proposed that the Austronesian people, who form the majority of the modern population in Indonesia, Malaysia, Brunei, East Timor, and the Philippines, may have migrated to Southeast Asia from Taiwan. 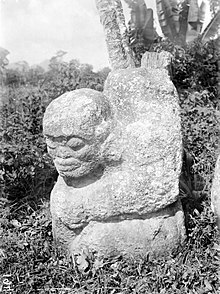 They arrived in Indonesia around 2000 BC, and as they spread through the archipelago, they often settled along coastal areas and confined indigenous peoples such as Orang Asli of peninsular Malaysia, Negritos of the Philippines or Papuans of New Guinea to inland regions. Archaeologists refer these people as Deutero-Malays, whom are more advanced in farming techniques and metal knowledge than their indigenous counterpart, the Proto-Malays. 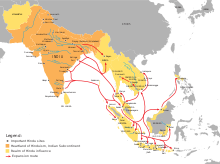 During the 13th century CE, the region experienced Mongol invasions, affected areas such as Vietnamese coast, inland Burma and Java. In 1258, 1285 and 1287, the Mongols tried to invade Đại Việt and Champa. The invasions were unsuccessful, yet both Dai Viet and Champa agreed to become tributary states to Yuan dynasty to avoid further conflicts. The Mongols also invaded Pagan Kingdom in Burma from 1277 to 1287, resulted in fragmentation of the Kingdom and rise of smaller Shan States ruled by local chieftains nominally submitted to Yuan dynasty. However, in 1297, a new local power emerged. Myinsaing Kingdom became the real ruler of Central Burma and challenged the Mongol rule. This resulted in the second Mongol invasion of Burma in 1300, which was repulsed by Myinsaing. The Mongols would later in 1303 withdrawn from Burma. In 1292, The Mongols sent envoys to Singhasari Kingdom in Java to ask for submission to Mongol rule. Singhasari rejected the proposal and injured the envoys, enraged the Mongols and made them sent a large invasion fleet to Java. Unbeknownst to them, Singhasari collapsed in 1293 due to a revolt by Kadiri, one of its vassals. When the Mongols arrived in Java, a local prince named Raden Wijaya offered his service to assist the Mongols in punishing Kadiri. After Kadiri was defeated, Wijaya turned on his Mongol allies, ambushed their invasion fleet and forced them to immediately leave Java. Kampung Laut Mosque in Tumpat is one of the oldest mosques in Malaysia, dating to the early 18th century. Fort Cornwallis in George Town marks the spot where the British East India Company first landed in Penang in 1786, thus heralding the British colonisation of Malaya. 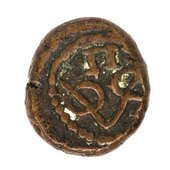 Duit, a coin minted by the VOC, 1646–1667. 2 kas, 2 duit. Relief map of Southeast Asia. Southeast Asia map of Köppen climate classification. 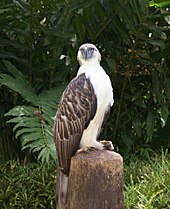 Wallace's hypothetical line divide Indonesian Archipelago into 2 types of fauna, Australasian and Southeast Asian fauna. 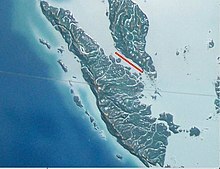 The deep water of the Lombok Strait between the islands of Bali and Lombok formed a water barrier even when lower sea levels linked the now-separated islands and landmasses on either side. The Port of Singapore is the busiest transshipment and container port in the world, and is an important transportation and shipping hub in Southeast Asia. The overseas Chinese community has played a large role in the development of the economies in the region. The origins of Chinese influence can be traced to the 16th century, when Chinese migrants from southern China settled in Indonesia, Thailand, and other Southeast Asian countries. Chinese populations in the region saw a rapid increase following the Communist Revolution in 1949, which forced many refugees to emigrate outside of China. Tourism has been a key factor in economic development for many Southeast Asian countries, especially Cambodia. According to UNESCO, "tourism, if correctly conceived, can be a tremendous development tool and an effective means of preserving the cultural diversity of our planet." Since the early 1990s, "even the non-ASEAN nations such as Cambodia, Laos, Vietnam and Burma, where the income derived from tourism is low, are attempting to expand their own tourism industries." In 1995, Singapore was the regional leader in tourism receipts relative to GDP at over 8%. By 1998, those receipts had dropped to less than 6% of GDP while Thailand and Lao PDR increased receipts to over 7%. Since 2000, Cambodia has surpassed all other ASEAN countries and generated almost 15% of its GDP from tourism in 2006. Furthermore, Vietnam is considered as a rising power in Southeast Asia due to its large foreign investment opportunities and the booming tourism sector, despite only having their trade embargo lifted in 1995. Population distribution of the countries of Southeast Asia (with Indonesia split into its major islands). Southeast Asia has an area of approximately 4,500,000 square kilometres (1,700,000 sq mi). As of 2016, around 642 million people live in the region, more than a fifth live (143 million) on the Indonesian island of Java, the most densely populated large island in the world. Indonesia is the most populous country with 261 million people, and also the 4th most populous country in the world. The distribution of the religions and people is diverse in Southeast Asia and varies by country. Some 30 million overseas Chinese also live in Southeast Asia, most prominently in Christmas Island, Indonesia, Malaysia, the Philippines, Singapore, and Thailand, and also as the Hoa in Vietnam. People of Southeast Asian origins are known as Southeast Asians or Aseanites. In modern times, the Javanese are the largest ethnic group in Southeast Asia, with more than 100 million people, mostly concentrated in Java, Indonesia. The second largest ethnic group in Southeast Asia is Vietnamese (Kinh people) with around 86 million population, mainly inhabiting in Vietnam, thus forming a significant minority in neighboring Cambodia and Laos. The Thais is also a significant ethnic group with around 59 million population forming the majority in Thailand. In Burma, the Burmese account for more than two-thirds of the ethnic stock in this country. A Native Indonesian Balinese girl wearing kebaya during a traditional ceremony. Indonesia is clearly dominated by the Javanese and Sundanese ethnic groups, with hundreds of ethnic minorities inhabited the archipelago, including Madurese, Minangkabau, Bugis, Balinese, Dayak, Batak and Malays. While Malaysia is split between more than half Malays and one-quarter Chinese, and also Indian minority in the West Malaysia however Dayaks is the most majority in Sarawak and Kadazan-dusun is the most majority in Sabah which are in the East Malaysia. The Malays are the majority in West Malaysia and Brunei, while they forming a significant minority in Indonesia, Southern Thailand, East Malaysia and Singapore. In city-state Singapore, Chinese are the majority, yet the city is a multicultural melting pot with Malays, Indians and Eurasian also called the island their home. Within the Philippines, the Tagalog, Visayan (mainly Cebuanos, Warays and Hiligaynons), Ilocano, Bicolano, Moro (mainly Tausug, Maranao, and Maguindanao) and Central Luzon (mainly Kapampangan and Pangasinan) groups are significant. Thai Theravada Buddhists in Chiang Mai, Thailand. Buddhist monks collecting alms in Luang Prabang, north Laos. The Kek Lok Si Buddhist Temple on Penang Island combines Chinese, Thai and Burmese architectural influences. Roman Catholic Cathedral-Basilica of the Immaculate Conception, the metropolitan see of the Archbishop of Manila, Philippines. Sultan Omar Ali Saifuddin Mosque in Brunei, an Islamic country with Sharia rule. The Sultan Haji Hassanal Bolkiah Masjid of Cotabato City, Philippines. 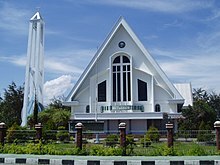 A Protestant church in Indonesia. Indonesia has the largest Protestant population in Southeast Asia. The Mother Temple of Besakih, one of Bali's most significant Balinese Hindu temples. No individual Southeast Asian country is religiously homogeneous. Some groups are protected de facto by their isolation from the rest of the world. In the world's most populous Muslim nation, Indonesia, Hinduism is dominant on islands such as Bali. Christianity also predominates in the rest of the part of the Philippines, New Guinea and Timor. Pockets of Hindu population can also be found around Southeast Asia in Singapore, Malaysia etc. Garuda (Sanskrit: Garuḍa), the phoenix who is the mount (vahanam) of Vishnu, is a national symbol in both Thailand and Indonesia; in the Philippines, gold images of Garuda have been found on Palawan; gold images of other Hindu gods and goddesses have also been found on Mindanao. Balinese Hinduism is somewhat different from Hinduism practised elsewhere, as Animism and local culture is incorporated into it. Christians can also be found throughout Southeast Asia; they are in the majority in East Timor and the Philippines, Asia's largest Christian nation. In addition, there are also older tribal religious practices in remote areas of Sarawak in East Malaysia, Highland Philippines and Papua in eastern Indonesia. In Burma, Sakka (Indra) is revered as a nat. In Vietnam, Mahayana Buddhism is practised, which is influenced by native animism but with strong emphasis on ancestor worship. Indonesia Indonesian, Javanese, Sundanese, Batak, Minangkabau, Buginese, Banjar, Papuan, Dayak, Acehnese, Ambonese Balinese, Betawi, Madurese, Musi, Manado, Sasak, Makassarese, Batak Dairi, Karo, Mandailing, Jambi Malay, Mongondow, Gorontalo, Ngaju, Nias, North Moluccan, Uab Meto, Bima, Manggarai, Toraja-Sa'dan, Komering, Tetum, Rejang, Muna, Sumbawa, Bangka Malay, Osing, Gayo, Bungku-Tolaki languages, Moronene, Bungku, Bahonsuai, Kulisusu, Wawonii, Mori Bawah, Mori Atas, Padoe, Tomadino, Lewotobi, Tae', Mongondow, Lampung, Tolaki, Ma'anyan, Simeulue, Gayo, Buginese, Mandar, Minahasan, Enggano, Ternate, Tidore, Mairasi, East Cenderawasih Language, Lakes Plain Languages, Tor-Kwerba, Nimboran, Skou/Sko, Border languages, Senagi, Pauwasi, Mandarin, Hokkien, Cantonese, Hakka, Teochew, Tamil, Punjabi, Bengali, and Arabic. Myanmar (Burma) Burmese, Shan, Kayin(Karen), Rakhine, Kachin, Chin, Mon, Kayah, Chinese and other ethnic languages. The culture in Southeast Asia is very diverse: on mainland Southeast Asia, the culture is a mix of Burmese, Cambodian, Laotian and Thai (Indian) and Vietnamese (Chinese) cultures. While in Indonesia, the Philippines, Singapore and Malaysia the culture is a mix of indigenous Austronesian, Indian, Islamic, Western, and Chinese cultures. Also Brunei shows a strong influence from Arabia. Vietnam and Singapore show more Chinese influence in that Singapore, although being geographically a Southeast Asian nation, is home to a large Chinese majority and Vietnam was in China's sphere of influence for much of its history. Indian influence in Singapore is only evident through the Tamil migrants, which influenced, to some extent, the cuisine of Singapore. Throughout Vietnam's history, it has had no direct influence from India – only through contact with the Thai, Khmer and Cham peoples. Moreover, Vietnam is also categorized under the East Asian cultural sphere along with China, Korea, and Japan due to the large amount of Chinese influence embedded in their culture and lifestyle. A paddy field in Vietnam. 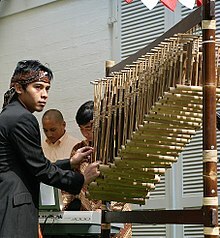 Angklung as a Masterpiece of Oral and Intangible Heritage of Humanity. Thai manuscript from before the 19th-century writing system. The use of Chinese characters, in the past and present, is only evident in Vietnam and more recently, Singapore and Malaysia. The adoption of Chinese characters in Vietnam dates back to around 111 B.C., when it was occupied by the Chinese. A Vietnamese script called Chữ Nôm used modified Chinese characters to express the Vietnamese language. Both classical Chinese and Chữ Nôm were used up until the early 20th century. ^ ASEAN Community in Figures (ACIF) 2013 (PDF) (6th ed.). Jakarta: ASEAN. February 2014. p. 1. ISBN 978-602-7643-73-4. Archived from the original (PDF) on 4 September 2015. Retrieved 9 May 2015. ^ Klaus Kästle (10 September 2013). 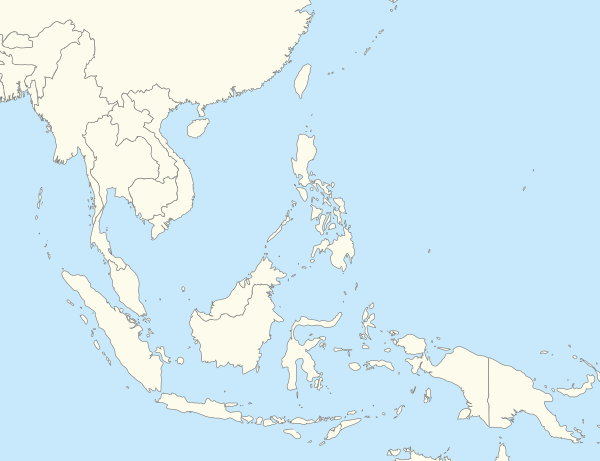 "Map of Southeast Asia Region". Nations Online Project. One World – Nations Online. Retrieved 10 September 2013. Nations Online is an online destination guide with many aspects of the nations and cultures of the world: geography, economy, science, people, culture, environment, travel and tourism, government and history. ^ Shaffer, Lynda Norene (18 February 2015). Maritime Southeast Asia to 500. Routledge. ISBN 9781317465201. ^ Chester, Roy (16 July 2008). Furnace of Creation, Cradle of Destruction: A Journey to the Birthplace of Earthquakes, Volcanoes, and Tsunamis. AMACOM. ISBN 978-0814409206. ^ "Population of Asia (2018) - Worldometers". www.worldometers.info. Retrieved 30 December 2018. ^ Zide; Baker, Norman H.; Milton E. (1966). Studies in comparative Austroasiatic linguistics. Foreign Language Study. 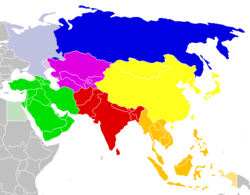 ^ "ASEAN Member States". ASEAN. ^ Lach; Van Kley, Donald F.; Edwin J (1998). Asia in the Making of Europe, Volume III. Chicago: University of Chicago Press. ISBN 9780226467689. ^ Eliot, Joshua; Bickersteth, Jane; Ballard, Sebastian (1996). Indonesia, Malaysia & Singapore Handbook. New York City: Trade & Trade & Travel Publications. ^ Park; King, Seung-Woo; Victor T. (2013). The Historical Construction of Southeast Asian Studies: Korea and Beyond. Singapore: Institute of Southeast Asian Studies. ISBN 9789814414586. ^ a b Emmerson, Donald K (1984). "Southeast Asia: What's in a Name?". Journal of Southeast Asian Studies. 15 (1): 1–21. doi:10.1017/S0022463400012182. JSTOR 20070562. Retrieved 9 December 2017. ^ "United Nations Statistics Division- Standard Country and Area Codes Classifications (M49)". United Nations Statistics Division. 6 May 2015. Retrieved 24 July 2010. ^ a b "Christmas Islands". CIA World Factbook. Retrieved 12 September 2009. ^ a b "Cocos (Keeling) Islands". CIA World Factbook. Retrieved 12 September 2009. ^ Baruah, Sanjib (2005). Durable Disorder: Understanding the Politics of Northeast India. Oxford University Press. ^ Friborg, Bastian (2010). Southeast Asia: Myth or Reality pg 4. ^ Inoue, Yukiko (2005). Teaching with Educational Technology in the 21st Century: The Case of the Asia-Pacific Region: The Case of the Asia-Pacific Region. Idea Group Inc (IGI). p. 5. ISBN 978-1-59140-725-6. ^ a b Bellwood, Peter (10 April 2017). First Islanders: Prehistory and Human Migration in Island Southeast Asia (1 ed.). Wiley-Blackwell. ISBN 9781119251545. ^ Demeter, Fabrice; Shackelford, Laura L.; Bacon, Anne-Marie; Duringer, Philippe; Westaway, Kira; Sayavongkhamdy, Thongsa; Braga, José; Sichanthongtip, Phonephanh; Khamdalavong, Phimmasaeng (4 September 2012). "Anatomically modern human in Southeast Asia (Laos) by 46 ka". Proceedings of the National Academy of Sciences. 109 (36): 14375–14380. Bibcode:2012PNAS..10914375D. doi:10.1073/pnas.1208104109. ISSN 0027-8424. PMC 3437904. PMID 22908291. ^ Morwood, M. J.; Brown, P.; Jatmiko; Sutikna, T.; Wahyu Saptomo, E.; Westaway, K. E.; Rokus Awe Due; Roberts, R. G.; Maeda, T.; Wasisto, S.; Djubiantono, T. (13 October 2005). "Further evidence for small-bodied hominins from the Late Pleistocene of Flores, Indonesia". Nature. 437 (7061): 1012–1017. Bibcode:2005Natur.437.1012M. doi:10.1038/nature04022. PMID 16229067. ^ Taylor, Jean Gelman (2003). Indonesia: Peoples and Histories. New Haven and London: Yale University Press. pp. 5–7. ISBN 978-0-300-10518-6. ^ Murdock, George Peter (1969). Studies in the science of society. Singapore: Books for Libraries Press. ISBN 9780836911572. ^ a b "Geneticist clarifies role of Proto-Malays in human origin". Malaysiakini. 25 January 2012. Retrieved 27 August 2017. ^ Deng, L; Hoh, B. P; Lu, D; Saw, W. Y; Twee-Hee Ong, R; Kasturiratne, A; De Silva, H. J; Zilfalil, B. A; Kato, N; Wickremasinghe, A. R; Teo, Y. Y; Xu, S (3 September 2015). "Dissecting the genetic structure and admixture of four geographical Malay populations". Science Reports. 5: 14375. Bibcode:2015NatSR...514375D. doi:10.1038/srep14375. PMC 585825. PMID 26395220. ^ Nola Cooke, Tana Li, James Anderson – The Tongking Gulf Through History – Page 46 2011 -"Nishimura actually suggested the Đông Sơn phase belonged in the late metal age, and some other Japanese scholars argued that, contrary to the conventional belief that the Han invasion ended Đông Sơn culture, Đông Sơn artifacts, ..."
^ Vietnam Fine Arts Museum 2000 "... the bronze cylindrical jars, drums, Weapons and tools which were sophistically carved and belonged to the World-famous Đông Sơn culture dating from thousands of years; the Sculptures in the round, the ornamental architectural Sculptures ..."
^ a b c d Hall, Kenneth R. (16 January 2011). A History of Early Southeast Asia: Maritime Trade and Societal Development, 100–1500. Lanham: Rowman & Littlefield Publishers. ISBN 9780742567610. ^ Ooi, Keat Gin (2004). Southeast Asia: A Historical Encyclopedia, from Angkor Wat to East Timor. ABC-CLIO. ISBN 978-1-57607-770-2. ^ a b Hall, Kenneth R. (2010). A History of Early Southeast Asia: Maritime Trade and Societal Development, 100–1500. Rowman & Littlefield Publishers. ISBN 978-0-7425-6762-7. ^ a b Vanaik, Achin (1997). The Furies of Indian Communalism: Religion, Modernity, and Secularization. Verso. ISBN 978-1-85984-016-0. ^ a b Montgomery, Robert L. (2002). The Lopsided Spread of Christianity: Toward an Understanding of the Diffusion of Religions. Greenwood Publishing Group. ISBN 978-0-275-97361-2. ^ Jan Gonda (1975). Handbook of Oriental Studies. Section 3 Southeast Asia, Religions. BRILL Academic. pp. 3–20, 35–36, 49–51. ISBN 978-90-04-04330-5. ^ Steadman, Sharon R. (2016). Archaeology of Religion: Cultures and Their Beliefs in Worldwide Context. Routledge. ISBN 978-1-315-43388-2. ^ Timme, Elke (2005). A Presença Portuguesa nas Ilhas das Moluccas 1511 – 1605. GRIN Verlag. p. 3. ISBN 978-3-638-43208-5. ^ Church, Peter (2017). A Short History of South-East Asia. John Wiley & Sons. ISBN 978-1-119-06249-3. ^ "Global Religious Landscape". The Pew Forum. Retrieved 4 May 2014. ^ Roszko, Edyta (1 March 2012). "From Spiritual Homes to National Shrines: Religious Traditions and Nation-Building in Vietnam". East Asia. 29 (1): 25–41. CiteSeerX 10.1.1.467.6835. doi:10.1007/s12140-011-9156-x. ISSN 1096-6838. ^ Baldick, Julian (15 June 2013). Ancient Religions of the Austronesian World: From Australasia to Taiwan. London: I.B.Tauris. ISBN 9781780763668. ^ Hall, Kenneth R. (2010). A History of Early Southeast Asia: Maritime Trade and Societal Development, 100–1500. Rowman & Littlefield Publishers. ISBN 978-0-7425-6762-7. ^ Mahbubani, Kishore; Sng, Jeffery (2017). The ASEAN Miracle: A Catalyst for Peace. NUS Press. p. 19. ISBN 978-981-4722-49-0. ^ Postma, Antoon (27 June 2008). "The Laguna Copper-Plate Inscription: Text and Commentary". Philippine Studies. 40 (2): 182–203. ^ Viet Nam social sciences 2002 Page 42 Ủy ban khoa học xã hội Việt Nam – 2002 "The first period of cultural disruption and transformation: in and around the first millennium CE (that is, the period of Bac thuoc) all of Southeast Asia shifted into strong cultural exchanges with the outside world, on the one hand with Chinese ..."
^ Malik, Preet (2015). My Myanmar Years: A Diplomat's Account of India's Relations with the Region. SAGE Publications. p. 28. ISBN 978-93-5150-626-3. ^ Iguchi, Masatoshi (2017). 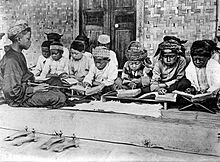 Java Essay: The History and Culture of a Southern Country. Troubador Publishing Ltd. p. 116. ISBN 978-1-78462-885-7. ^ Mukherjee, Rila (2011). Pelagic Passageways: The Northern Bay of Bengal Before Colonialism. Primus Books. p. 76. ISBN 978-93-80607-20-7. ^ Damian Evans; et al. (9 April 2009). "A comprehensive archaeological map of the world's largest preindustrial settlement complex at Angkor, Cambodia". PNAS. 104 (36): 14277–82. Bibcode:2007PNAS..10414277E. doi:10.1073/pnas.0702525104. PMC 1964867. PMID 17717084. ^ Kiernan, Ben (2007). Blood and Soil: A World History of Genocide and Extermination from Sparta to Darfur. Yale University Press. p. 110. ISBN 978-0-300-13793-4. ^ Bulliet, Richard; Crossley, Pamela; Headrick, Daniel; Hirsch, Steven; Johnson, Lyman (2014). The Earth and Its Peoples: A Global History. Cengage Learning. p. 336. ISBN 978-1-285-96570-3. ^ Hardiman, John Percy (1900). Gazetteer of Upper Burma and the Shan States. superintendent, Government printing, Burma. ^ Bernice Koehler Johnson (2009). The Shan: Refugees Without a Camp, an English Teacher in Thailand and Burma. Trinity Matrix Publishing. p. 11. ISBN 978-0-9817833-0-7. ^ Kohn, George Childs (2013). Dictionary of Wars. Taylor & Francis. p. 446. ISBN 978-1-135-95501-4. ^ Whiting, Marvin C. (2002). Imperial Chinese Military History: 8000 BC-1912 AD. iUniverse. p. 408. ISBN 978-0-595-22134-9. ^ Hardiman, John Percy (1900). Gazetteer of Upper Burma and the Shan States. superintendent, Government printing, Burma. ISBN 9780231500043. ^ SarDesai, D. R. (2012). Southeast Asia: Past and Present. Avalon Publishing. ISBN 978-0-8133-4838-4. ^ Rao, B. V. History of Asia. Sterling Publishers Pvt. Ltd. ISBN 978-81-207-9223-4. ^ John Miksic (1999). Ancient History. Indonesian Heritage Series. Vol 1. Archipelago Press / Editions Didier Millet. ISBN 9789813018266. ^ Hipsher, Scott (2013). The Private Sector's Role in Poverty Reduction in Asia. Elsevier. ISBN 978-0-85709-449-0. ^ Federspiel, Howard M. (2007). Sultans, Shamans, and Saints: Islam and Muslims in Southeast Asia. University of Hawaii Press. ISBN 978-0-8248-3052-6. ^ Hardt, Doug (2016). Who Was Muhammad? : An Analysis of the Prophet of Islam in Light of the Bible and the Quran. TEACH Services, Inc. ISBN 978-1-4796-0544-6. ^ Anderson, James (21 March 2013). Daily Life Through Trade: Buying and Selling in World History. ABC-CLIO. ISBN 978-0-313-36325-2. ^ Ayoub, Mahmoud (2013). Islam: Faith and History. Oneworld Publications. ISBN 978-1-78074-452-0. ^ Wang Ma, Rosey (2003). Chinese Muslims in Malaysia: History and Development. Center for Asia-Pacific Area Studies, Academia Sinica. ^ a b c Prabhune, Tushar (27 December 2011). "Gujarat helped establish Islam in SE Asia". Ahmedabad: The Times of India. ^ Baten, Jörg (2016). A History of the Global Economy. From 1500 to the Present. Cambridge University Press. p. 282. ISBN 978-1-107-50718-0. ^ Baten, Jörg (2016). A History of the Global Economy. From 1500 to the Present. Cambridge University Press. p. 286. ISBN 978-1-107-50718-0. ^ Joseph Chinyong Liow, What does the South China Sea ruling mean, and what's next?, Brookings Institution (July 12, 2016). ^ Euan Graham, The Hague Tribunal's South China Sea Ruling: Empty Provocation or Slow-Burning Influence?, Lowy Institute for International Policy (August 18, 2016). ^ Davis, Lee (1992). Natural disasters: from the Black Plague to the eruption of Mt. Pinatubo. New York, NY: Facts on File Inc.. pp. 300–301. ^ "Climate Change Impacts - South East Asia". Archived from the original on 29 August 2017. ^ "Climate Reality Watch Party 2016". 13 December 2012. ^ Navjot S. Sodhi; Barry W. Brook (2006). Southeast Asian Biodiversity in Crisis. Cambridge University Press. p. 68. ISBN 978-0-521-83930-3. ^ Murray L Weidenbaum (1 January 1996). The Bamboo Network: How Expatriate Chinese Entrepreneurs are Creating a New Economic Superpower in Asia. Martin Kessler Books, Free Press. pp. 23–28. ISBN 978-0-684-82289-1. ^ Sean Yoong (27 April 2007). "17 Firms to Build $500M Undersea Cable". International Business Times. Archived from the original on 27 September 2007. Retrieved 28 July 2007. ^ Background overview of The National Seminar on Sustainable Tourism Resource Management Archived 24 March 2012 at the Wayback Machine, Phnom Penh, 9–10 June 2003. ^ What is the G-20 Archived 4 May 2011 at the Wayback Machine, www.g20.org. Retrieved 6 October 2009. ^ "Report for Selected Countries and Subjects". Imf.org. 20 September 2017. Retrieved 22 January 2017. ^ "SE Asia Stocks-Jakarta, Manila hit record highs, others firm". Reuters. 27 September 2010. ^ Bull Market Lifts PSE Index to Top Rank Among Stock Exchanges in Asia | Manila Bulletin. Mb.com.ph (24 September 2010). Retrieved on 17 October 2011. ^ National Accounts Main Aggregates Database, 2015, (Select all countries, "GDP, Per Capita GDP – US Dollars", and 2015 to generate table), United Nations Statistics Division. Accessed on 5 July 2017. ^ "Country Comparison :: Population". CIA. July 2017. Retrieved 2 September 2017. ^ "World Economic Outlook (April 2017) – Nominal GDP". IMF. Retrieved 26 August 2017. ^ "World Economic Outlook (April 2017) – Nominal GDP per capita". IMF. Retrieved 26 August 2017. ^ "Field Listing – Religions". CIA Factbook. Retrieved 24 February 2007. ^ "National Commission on Muslim Filipino". www.ncmf.gov.ph. ^ BuddhaNet. "World Buddhist Directory – Presented by BuddhaNet.Net". buddhanet.info. ^ "Table: Religious Composition by Country, in Percentages". 18 December 2012. ^ CIA – The World Factbook – Brunei. Cia.gov. Retrieved on 17 October 2011. ^ CIA – The World Factbook – Cambodia. Cia.gov. Retrieved on 17 October 2011. ^ CIA – The World Factbook – Christmas Island. Cia.gov. Retrieved on 17 October 2011. ^ CIA – The World Factbook – Cocos (Keeling) Islands. Cia.gov. Retrieved on 17 October 2011. ^ CIA – The World Factbook – East Timor. Cia.gov. Retrieved on 17 October 2011. ^ "Top 20 Countries by Number of Languages Spoken". www.vistawide.com. Retrieved 28 May 2016. ^ CIA – The World Factbook – Laos. Cia.gov. Retrieved on 17 October 2011. ^ CIA – The World Factbook – Malaysia. Cia.gov. Retrieved on 17 October 2011. ^ "Country: Myanmar (Burma)". Joshua Project. ^ CIA – The World Factbook – Thailand. Cia.gov. Retrieved on 17 October 2011. ^ CIA – The World Factbook – Vietnam. Cia.gov. Retrieved on 17 October 2011.